Three weeks earlier, on 14 April he had captained a South Midlands Division team to a 17–0 victory in a game of rugby against the 4th Division, with Basil Maclear, the former Irish international, as referee. It was Poulton’s last. His team included two other internationals, Sidney Smart of England, and William Middleton Wallace of Scotland, while the opposition fielded Billy Hinton and Tyrell, both of Ireland, Rowland Fraser of Scotland, and Morton of England. Ronald Poulton Palmer’s grave is in Hyde Park Corner (Royal Berks) Cemetery, near Ploegsteert, Belgium. A memorial to him was erected at Balliol College, on the west wall of the Chapel passage. 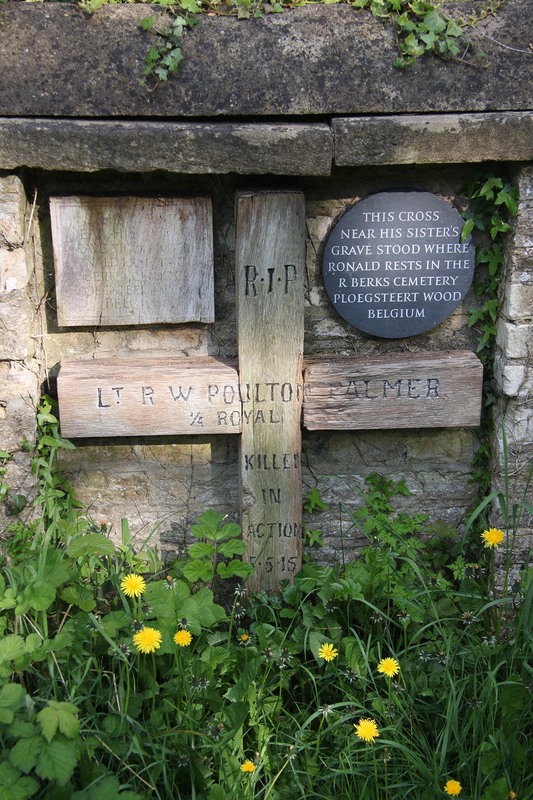 The cross marking Poulton’s grave in Flanders was taken back to Oxford, and is mounted in a wall in Hollywell Cemetery. Twenty seven England international rugby players were killed in World War I of a total international toll of one hundred and thirty. One of the most notable was Poulton-Palmer, who was considered by many contemporary observers as perhaps the greatest-ever attacking rugby union threequarter. More information here on Wikipedia. Regiment/Service: Royal Berkshire Regiment 1st/4th Bn. Additional Information: Son of Professor Edward Bagnall Poulton and Mrs. Emily Palmer Poulton, of Wykeham House, Oxford. 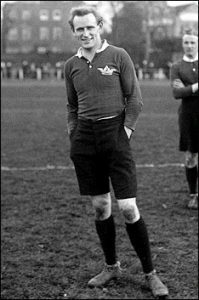 Captain of the England Rugby Football XV in 1914. Photograph courtesy of David Milborrow.